Since the late 19th century, large numbers of Dutch settled in Canada. Prices of arable land in the Dutch-favoured regions in the U.S. had soared, and Canada became a popular alternative. Emigration peeked around the turn of the century. Emigration stopped almost completely during the world wars and the great depression. Triggered by the low economic prospects and the rampant housing shortage, emigration peeked again after the second world war. Canada became the most popular destination for Dutch emigrants. The first group of post-war emigrants were the war brides (Canadese bruiden, Canadian brides, in Dutch), young women, many of them with babies, who were engaged to Canadian soldiers that took part in the liberation of The Netherlands. Post-war emigrants were not only farmers, but also many skilled and semi-skilled workers, settling in the cities. Currently, a million Canadians claim to be of Dutch descent (or Dutch-born themselves), 300,000 are still able to speak Dutch. 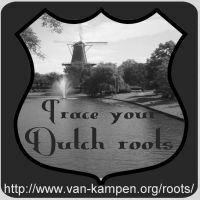 As far as I know, there is no large online database of Dutch immigrants in Canada, but there are some passenger lists scattered around the internet. There is a (small) index of freely accessible passenger lists on Digital resources Netherlands and Belgium. Should New York become Dutch again?